There are many sound chips on the market (at very low cost) and they produce very interesting sounds. The UM3561 is one of these IC’s. It can be used in many different applications, including model railway layouts, to add realism to some of the dioramas. It contains 4 different siren sounds and these can be accessed by taking a “control line” (pin) either HIGH or LOW. 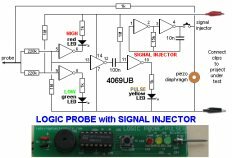 When no pins (lines) are “controlled,” (taken HIGH or LOW) the chip produces a POLICE CAR SIREN. When pins (called SEL 1 and SEL 2) are taken HIGH or LOW, it produces FIRE(ing) of a MACHINE GUN (not a fire engine sound), HEE HAW or a WAILING ALARM. These sounds can be added to an alarm project or a toy for a child. The output is quite loud on 3v (with a small speaker) and will be very annoying when connected to a power amplifier driving a horn speaker. When used as a house alarm, no Select lines are connected HIGH or LOW and the chip produces POLICE CAR SIREN when activated. The chip is turned ON by the house alarm and fed into a power amplifier driving a horn speaker. 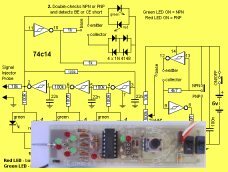 This project is designed to test the chip and can be added to a toy truck where a child will find it entertaining to change the sounds and annoy everyone within 10 minutes. The chip operates on 3v and the supply must not be more than 5v. The chip is designed to produce POLICE CAR SIREN when it is turned ON as Select line 2 is internally pulled LOW. When this line is taken HIGH, the chip produces the sound of a MACHINE GUN FIRING. 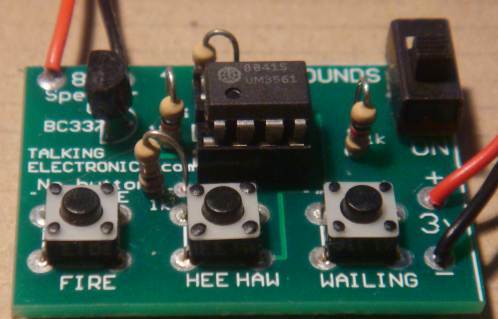 The other two sounds are a WAILING SIREN and HEE HAW from Select line 1. 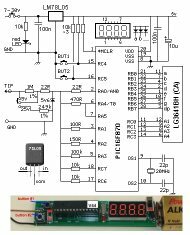 Just in case two switches are pressed at the same time, two 1k resistors (you only need one 1k resistor) have been added to prevent a short-circuit across the supply rail. If they are both pressed, HEE HAW is produced. 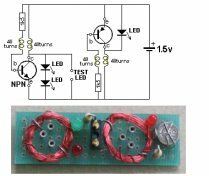 The printed circuit board is very simple and you can copy the layout on Matrix Board and join the lands with fine tinned copper wire. Matrix Board is a set of holes spaced at 0.1 inch apart and can be punched or drilled on plain board or have copper or tinned lands to make soldering easy. Do not use STRIP BOARD as the strips have to be cut and this is a very messy job. Note: The PC board shown in the diagram is double-sided with 3 tracks (called traces) on the top. You will need to use fine enamelled wire, if you are making your own single-sided board. There are many other SOUND CHIPS with siren sounds, animal sounds and train sounds, on the market. They are all very realistic and can be used for experimenting or adding to a more-complex project. The barking dog IC is very realistic and the 4 train sounds IC can be added to your layout for a very realistic effect. 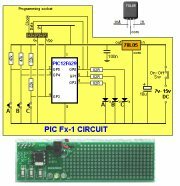 The author has experimented with all these IC’s and used them in many different projects. The chips are very complex and you cannot get the same sound without investing a lot of time and effort and then you will realise the SOUND CHIP is the answer. You can also get some very interesting chips in greeting cards and also in small toys – so look in different shops and you will be surprised. Experimenting with these chips is great fun and you will learn a lot when you interface (connect) them to amplifiers and switches to get them to work and then you can give them to one your younger family members. 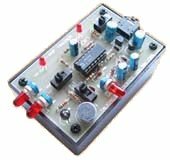 A kit of components is available from Talking Electronics. All the components are included in the kit and everything is identified on the board.